I arrived Friday evening at the pass (after 6:00 P.M.) to be greeted by members of the 2nd New Jersey and 3rd New Jersey (Chris Heran, Jack DeMetro and Pete Caruso). It was cloudy but no rain was falling. I set up and then went to find forage for my wagon and something to eat. It rained a little during the night but Saturday morning proved to be cloudy but dry (as did much of the day). We were waken by a bugle call which was a so – so rendition of reveille (Frosty, we missed you) ate breakfast and unfurled the colors. Soon additional members of the 3rd New Jersey arrived, Rich Laddusire, Dave Maiello, Rob Toole and our new Fresh Fish Kevin and Tim Shanahan plus about 6 members from the 28th Massachusetts. We began the day with inspection of arms then drill. We ate lunch then more drill. The afternoon drill was with the bayonet, instructed by Walt Bardger of the 2nd New Jersey who did an outstanding job. The drill ended with each member attacking the bayonet dummy which was set up by the 2nd New Jersey. At 1:00 P.M. we put on a firing demonstration conducted by Lieutenant Ken Friedman and Sergeant Bardger of the 2nd New Jersey. The firing demonstration included Firing by Files and Firing while Lying. After the demonstration we rested and assembled at about 1:45 P.M. Colonel Kevin Ayer, who arrived earlier, gave a brief talk on the battle and when concluded we departed, by wagon, for the jump off point in the town of Burkettsville. We stepped off with the 2nd New Jersey colors in the lead, passing through Burkettsville town to begin our ascent up the hill. Lieutenant Friedman at points during the march would narrate the First Jersey Brigades Movements. At one point, about a quarter of the way up, we stopped along a side road to hear more details of the Jersey Brigades movements from Sergeant Bardger, after which the march continued. At about three quarters of the way up we stopped to survey an old church that was there during the battle. The church was not used any more and was in very bad condition. The boys roamed through the cemetery finding 2 graves, over grown with weeds, of a World War I and World War II soldier. It was sad to see those graves in that condition. Soon the word to assemble was given and the march continued to the top. Near the top Lieutenant Friedman (who I put in charge of the company) gave the order to double quick the last 15 yards to the end point. Once on top of the pass Sergeant Bardger read the After Action Report of the 2nd New Jersey and I read the After Action Report of the 3rd New Jersey, written by Colonel Brown (who called it Crampton’s Pass). Once the action reports were finished the names of those killed and those died of wounds, during and from the battle, were read out loud of all 4 Regiments. The 1.6 mile march up the pass was not easy but all of the boys in the 2nd and 3rd New Jersey and the 28th Massachusetts completed it. I am very proud of Jack DeMetro, Pete Caruso, Rob Toole, Rich Laddusire, Dave Maiello, and Kevin and Tim Shanahan who completed the march and did our Regiment proud. We finished as did the original 3rd New Jersey did coming up the Gapland Road into the mouth of the Troup Artillery of Cobb’s Legion. Chris Heran is also to be commended. Because of his knee he drove the van if any of the boys could not make it and needed help. It was a very narrow and winding road and he maneuvered it skillfully. After the march we ate dinner and then sat around the fire and sang some songs, had fun and enjoyed our friendship. On Sunday morning we departed for home. I went with the 2nd New Jersey to Antietam where we met up with Kim Perloto of our 3rd Battalion, USV and who is also a member of the 8th Connecticut. We fell in with the 8th Connecticut and followed their route from the Burnside Bridge (the 8th Connecticut was attached to the 2nd Division, 3rd Brigade, 9th Corps) to where they were forced to retreat by A.P. Hill’s attack after he arrived from Harper’s Ferry. 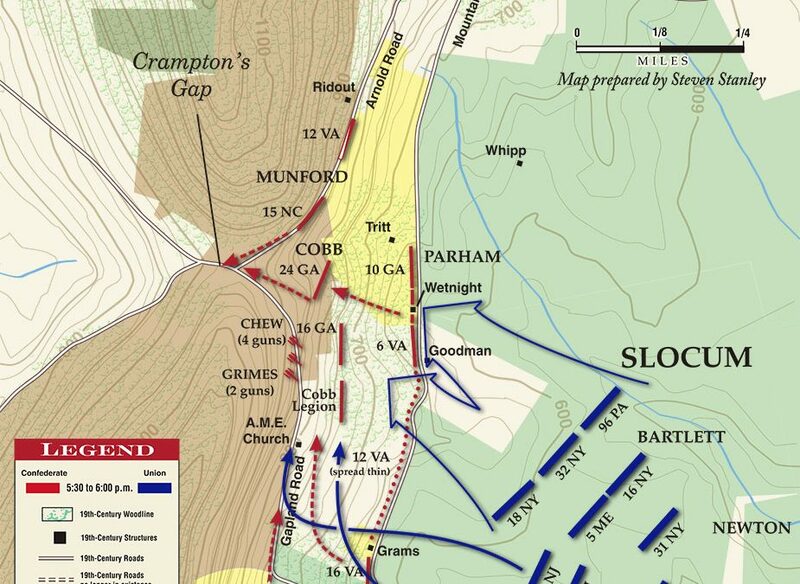 The 8th Connecticut was the only Regiment in it’s brigade (after the rest of their Brigade was repulsed) to continue the attack that should have been made by the whole Brigade. After the march I changed, got into my wagon and headed for home. During my ride home my reflection of the event was one of Pride, not a boastful or sinful pride but one of satisfaction that those of us who were here were fortunate to represent the men of one of the finest Regiments which served in the Army of the Potomac. JERSEY BLUE!